The Doors late frontman Jim Morrison has been honoured by two of his former bandmates on the 40th anniversary of his death today (July 3). Keyboardist Ray Manzarek and guitarist Robby Krieger visited the singer's grave inParis to light candles in his memory, reports Associated Press. 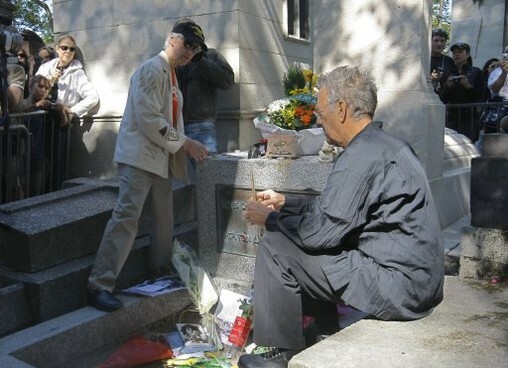 They were joined at the Pere Lachaise cemetery by a group of Morrison's fans, who laid flowers while wearing t-shirts bearing the words "40th anniversary". The grave has long been a pilgrimage site for his fans. Morrison died in 1971 in the French capital, with the cause of death believed to have been a drug overdose. However, there are many theories surrounding his death, with some fans believing he faked his demise and is still alive today.